Tagged as “Il Divino” or The Divine One, Urbino, Italy native Raffaello Santi or simply Raphael, was one of the supreme triumvirate of Italian High Renaissance Old Masters, which included Leonardo da Vinci and Michelangelo. These two master, as well as Fra Bartolommeo, Massacio and Pietro Perugino were the main influencers in the works of Raphael. He was called Il Divino, just like Michelangelo, for many believed his works were inspired by God, not a surprising concept, since most of his works were religion-oriented. Raphael was widely known for his spatial geometry and perfect grace of his drawings and paintings. Most notable of his works were the frescoes in the Raphael Rooms at the Palace of the Vatican (considered as some of the greatest paintings during the Renaissance), the “Sistine Madonna” and the “Transfiguration.” He was also an architect and made several contributions to the design and construction of the Villa Madama in Rome, the façade of the Palazzo Pandolfini in Florence, the Chigi Chapel in Rome and the Church of St. Maria. Raphael’s father, Giovanni was a court painter and taught his son the rudiments of painting. He became an apprentice to Pietro Perugino when he was a teenager. Perugino at that time was Umbrian School’s leading painter. Raphael, who was born in 1483 was called a master in 1501, meaning he had been fully trained and qualified at the age of 18, surpassing his teacher..
Leonardo da Vinci, who was 30 years older than Raphael, had an influence in his career while he was in Florence. The influence showed in his portraits showing sitters in three-quarter lengths. To give subtlety to the human flesh, Raphael perfected the sfumato technique of Da Vinci. It was in 1508, at age 25 when Raphael moved to Rome, where he stayed until his death. He was already famous as a very outstanding High Renaissance artist and in Rome he shone more, painting some of the most beautiful frescos on the sacred walls of the Vatican. Three years later he started painting the first of his famous so-called Raphael Rooms or Stanze, the Stanza della Segnatura. 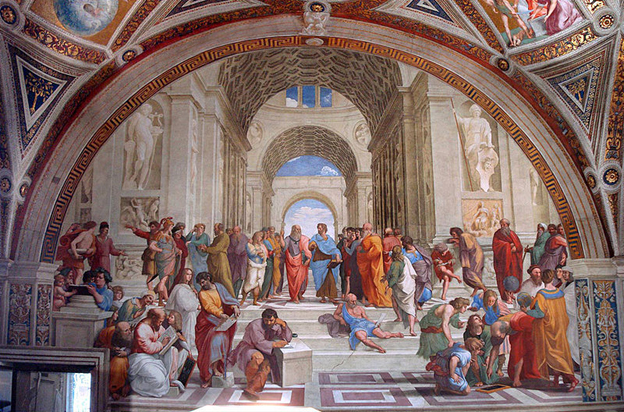 Raphael was commissioned to paint three rooms in the Vatican Palace. He had a team of assistants to finish the works, which showed the influence of Michelangelo who was painting the Sistine Chapel at that same time. Although he was preoccupied with the Vatican commission, he was also able to paint portraits such as “Pope Leo X with Cardinals” and “Portrait of Baldassare Castiglione.” Moreover, he managed to do decorative frescoes for some villas and churches, such as Santa Maria del Popolo and Santa Maria della Pace. 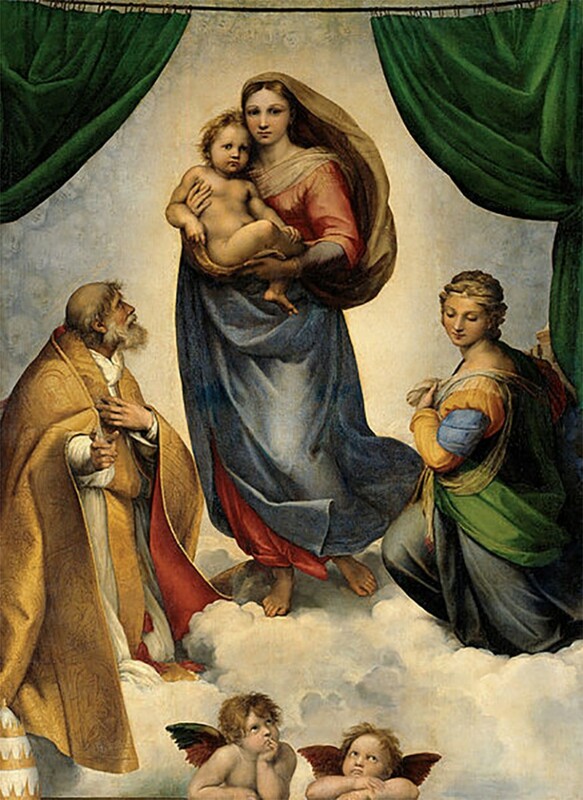 Aside from painting, Raphael was also an excellent tapestry artists and was commissioned by Pope Leo X to do 10 cartoons for the Vatican that were woven in Brussels. Although he only lived for a short time, Raphael left a large number of works and several masterpieces, as well as a reputation of being one of art history’s most naturally-gifted painters, whom Michelangelo was so jealous of. Together with Titian, a Venetian painter, Raphael holds the banner as one of Renaissance art’s most illustrious exponents.